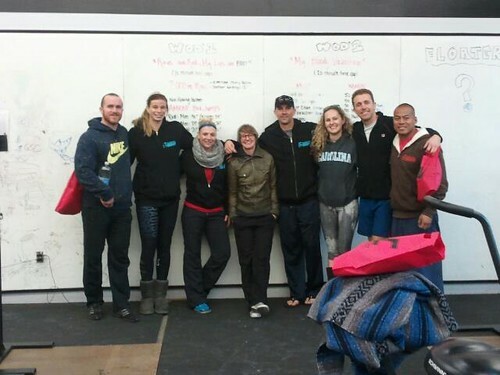 Home » WOD Blog » Testing Week! Nutrition Challenge Details being released this Wednesday with a Paleo Potluck on Friday to discuss the details! TESTING WEEK! The overall volume will be decreased this week, but the intensity will be high! Come in and go for a Personal Record and/or set your Baselines! Check out the programming for the week and plan accordingly. We understand that most of you will not be able to attend every class. Talk to your coaches, utilize open gym times and don’t panic if you miss something. We will have an official testing week every 3 months, so be sure to write your numbers and details down if you scale! 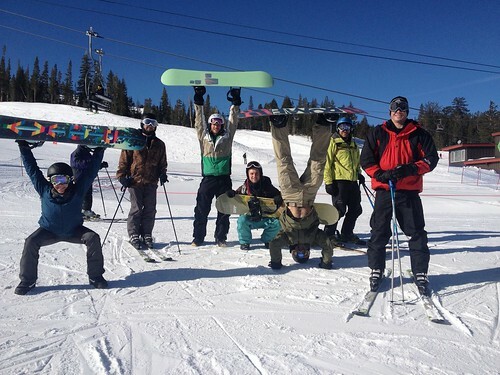 Mammoth 2013!! Good times, amazing weather and great people. Thanks to everyone that came out, I cannot wait to head up again! St Valentines Day Massacre crew this weekend! Suver and McCoy placed 2nd and Jordan and Sara J placed 3rd overall in the advanced division! Jess and Tibor placed 3rd overall in the modified division! That’s 3 out of the 6 total podium places for PCF! Woop woop! Big congratulations to all 6 teams that represented PCF this weekend: Ariel/Clive, Eduardo/Jaime LG, Jordan/Sara, Bailey/Zeb, Jess/Tibor and McCoy/Suver. Bring on the CrossFit Games! Get ready for the Nutrition Challenge coming up! Check out this email I received from someone that attended my most recent CrossFit 201 Nutrition Discussion. She takes her nutrition seriously and is continuously experimenting, learning and asking questions. Enjoy! I just wanted to THANK YOU for hosting an awesome nutrition seminar that Jackie invited me to over a week ago. It was pretty awesome to meet people with the same lifestyle because in my neck of the woods, people like us are scarce. It’s been a long road trying to figure out what diet would work for me but attending your seminar was the last missing piece of the puzzle. I noticed that you weren’t too keen on the idea of protein powder and that we should be getting our nutrients from real food instead. I did some more research on that idea and figured out that whey protein is highly insulinogenic. I have PCOS and insulin resistance and I’ve been drinking protein shakes for years…no bueno. I also never noticed how sub-consciously scared I was of fats. I knew that Paleo meant eating more fats but I surely wasn’t eating enough of it for fuel. 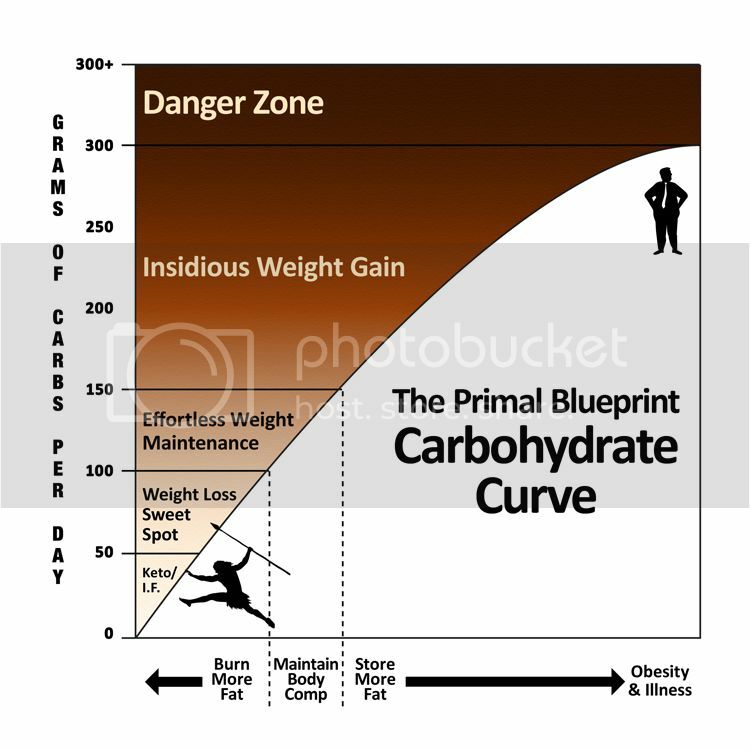 So, I took your advice with changing my meals to 2-3 times a day, nixing the protein powder and all fruits, adding more fats, and using this nifty Carb Curve from Mark Sisson and BINGO! I shed 5 lb. in a week…gnarly, dude! Not to mention my appetite came back. I guess going from 5 meals to 2-3 a day will do that to you. As long as I keep my carbs under 50g a day to keep my insulin in check and Xfitting 3-4x a week, I should be good and hope to shed some more pounds soon. My next question is how much carbs do you think I need for an hour of xfitting? I know that’s a hard question to answer considering every WOD/person is different but what do you think is an approximate amount of carbs that would be sufficient for heavy lifting, sprinting, etc.? According to Mark Sisson, the brain only needs about 30 g of glucose to function properly…but is glucose and carbs interchangable? Check out this article: https://www.marksdailyapple.com/how-much-glucose-does-your-brain-really-need/ If so, then I’m only at 50 g a day max, that means I only have 20 g to spare for a WOD and I don’t think that’s enough. I’m going to start experimenting to see how well I can perform on as little carbs as possible but do you have any advice? I remember you mentioned you experimented eating nothing but protein and fats. How did that go? I know you said bad, but how bad was it and were you xfitting, too? Thanks for all your help. It’s much appreciated. Cheers!